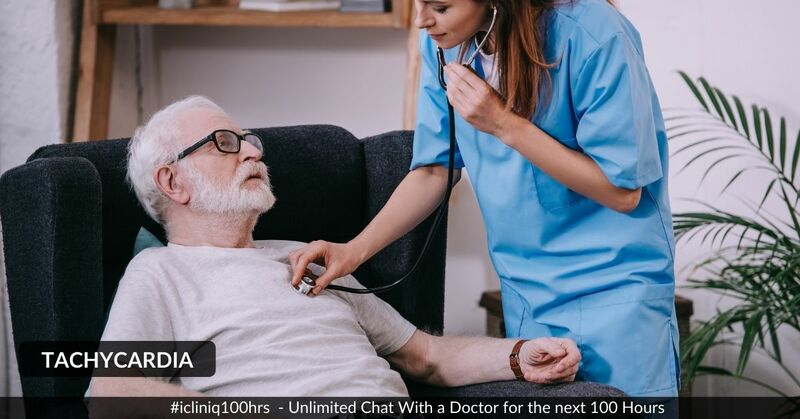 iCliniq › Ask a doctor online › Health Articles › Palpitations › Treat Tachycardia (increased heart rate) with Home Remedies!! • What Are the Home Remedies? Tachycardia means increased heart rate above the normal limit. The normal range of heart rate is 70 to 100 beats per minute. Usually the term tachycardia means heart rate above 100 beats per minute. Tachycardia increases the rhythm and rate of any two chambers or all chambers of the heart. Heart rate is best controlled by pacemaker of the heart which passes electrical signals. The most common causes of tachycardia are stimulation of the heart by the sympathetic nerves, increased body temperature by fever and toxic conditions of the heart. Let us have a look on the description how above causes increase heart rate. Increase in body temperature: 18 to 20 beats per degree Celsius is increased when body temperature reaches up to about 40.5 degree Celsius. The reason for increase in the heart rate is that, increase in body temperature may further maximize the rate of metabolism of the body and the sinus atria node (it is the pacemaker of the heart which is responsible for production of the heart beat an it is situated in the right side of the heart in the right atria). This increased rate has direct link to excitability and rate of rhythm of the heart rate. Above this temperature, heart rate decreases because heart is unable to pump. Sympathetic tone: Factors such as hemorrhage, bleeding, or shock may increase the sympathetic activity (stimulation to increase the heart pumping) of the heart. When a patient has lost blood, sympathetic activity of the heart increases to compensate the demand of oxygen. That time heart rate goes beyond 100 to 150 beats per minute. Toxic condition of the heart: When heart becomes weak to pump blood due to presence of any abnormalities of the heart, sympathetic activity will increase the heart rate, rhythm and force of contraction. Presence of palpitations (strong and irregular pulse which is palpated on chest), mild to severe chest pain, headache, breathing difficulties, dizziness, anxiety and syncope (patient may become unconscious due to less blood flow to brain) are the most common symptoms of tachycardia. It increases the chance of shock, increased blood pressure, heart attack, stroke and sudden death. Following remedies are used to decrease or stop tachycardia and other abnormalities of heart such as arrhythmias (abnormal heart rhythm). Use of cold water/cold packs - The person should wash her or his forehead with cold water or do fast rubbing of ice packs on the forehead, face and neck. Ice rubbing increases the stimulation of vagus nerve of heart. Vagal nerve supplies to sinus node of the heart which is responsible for production of heart beat. Vagal tone always decreases the activities of the heart and rhythm of contraction. Five minutes is necessary for fast recovery. Eat more bananas - Banana contains a large amount of potassium. Banana is one of the best sources of potassium supplement. Potassium is an electrolyte known for reducing heart rate, because it decreases the excitability of the cardiac muscle tissue. Banana has 400 to 500 mg of potassium. This will fulfill 11 to 12 percent of daily requirements. Sodium is less in banana approximately less than 1 mg. Sodium is the main element for stimulation of cardiac fiber responsible for generation of heart rate. An intake of 3 bananas daily is necessary to reduce the heart rate. Raisins - Use of raisins in diet provides lots of energy and it also high in potassium. It contains over 1000 mg of potassium, which almost fulfils the daily requirements for potassium and contains low (less than 60 mg) sodium. 20 to 30 grams of raisins per day are necessary for good healthy heart. Motherwort - It is also referred as Leonurus cardiaca. It is one of the best remedies to lower the heart rate. It is a type of mint. Plants, leaves, seeds and flowers of mother wart are mainly used in production of medicines. One naturopathic doctor stated that motherwort has properties like diuretics (reduction of blood pressure by increasing the excretion of urine) and also serves as menstruation stimulant. Motherwort causes depression of central nervous system and sympathetic stimulation of heart. So, it is mainly used for heart rate reduction and blood pressure reduction. Dosage - one should take 30 - 50 drops of motherwort tincture 3 times a day before meal. Hawthorn - It is also referred as Crataegus laevigata. It is mainly used for lowering the heart rate. It improves pumping action of the heart, dilatation of blood vessels and increases the conduction of nerve transmission. Due to widening of the blood vessels, load on the heart is decreased and blood pressure and heart rate both are decreased. Further more it lowers the concentration of bad cholesterol, low density lipoprotein, and bad cholesterol from the blood. So, it decreases the viscosity of the blood and also work load on the heart. It works by increased excretion of bile, decrease cholesterol production and antioxidant activity. Dosage - doses of 160 mg to 1800 mg divided and taken in 2 doses daily until heart rate comes back to normal stage. Valerian - It is a herb used to lower the pulse rate. Valerian root is used to make medicines to slow down the pulse rate. It depresses sympathetic tone and increases the vagal tone which is responsible for lowering the heart rate. Dose - 300 mg to 600 mg depending upon the severity of symptoms, 2 hours before bed time for seven days. Relaxation techniques - Mental and physical relaxation is an essential part for reduction of heart rate. Emotional crisis such as anxiety, anger, comprehension cause release of adrenaline and catecholamine hormones. These hormones are responsible for tachycardia. Relaxation technique prevents release of these hormones. Relaxation techniques are yoga (concentrate in breathing in and breathing out), meditation, biofeedback (meditation through positive visual feedback), deep breathing techniques. About 30 minutes of relaxation session per day lowers the heart rate. Aromatherapy with essential oils also provides mental relaxation. Do you have a question on Palpitations or Meditation?